Dr. Jacob Krive is Clinical Assistant Professor at UIC’s College of Applied Health Sciences, Department of Biomedical and Health Information Sciences. 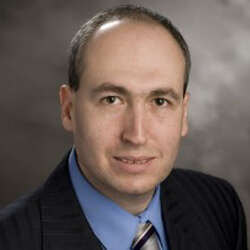 His research interests include patient health outcomes improvement through data analysis and clinical decision support interventions, healthcare data management, medical ontologies, evidence-based medicine, effective use of information technology and clinical sciences to reduce medical errors and cost of care, healthcare project management, and process engineering. Jacob Krive received his Ph.D. in information systems and biomedical informatics at Nova Southeastern University in Fort Lauderdale, Florida. He also holds MBA, MS, and BS degrees from University of Maryland University College, as well as CPHIMS and Lean Six Sigma professional certifications. Professor Krive currently teaches and/or designs curriculum in project management, healthcare networks and communications, systems analysis and design, clinical decision support systems, and process engineering. Jacob Krive is employed by Advocate Health Care, the largest integrated healthcare delivery network in Illinois, as information systems project manager. Over the course of his long career with Advocate, Dr. Krive served in many technical and leadership capacities, including systems architect/integrator, manager over teams responsible for workforce management, clinical & financial decision support, nursing effectiveness, clinical systems integration, and learning & talent management applications, and most recently, in charge of Advocate’s combined clinical software engineering and systems integration program, focusing on such pressing issues as population health management, patient and provider portals, healthcare information exchanges (HIE), enterprise master patient index (EMPI), and clinical interfaces (HL7). Jacob Krive? ?s past professional experience includes permanent and technical consulting positions with such companies as Lockheed Martin, IBM, United Airlines, Health Care Services Corporation (Blue Cross Blue Shield of Illinois), CNA Insurance, and Comdisco/SunGard. Jacob Krive specializes in highly visible large IT projects that affect thousands of associates and patients annually and deliver effectiveness, efficiency, employee and patient satisfaction, and quality outcomes. Dr. Krive frequently presents at professional and academic conferences on subjects of health outcomes, biomedical research, nursing effectiveness, workforce management, and healthcare management innovation. His interviews and quotes appeared in a number of health information technology press releases. He is a reviewer and contributor for the Academy of International Business (AIB) and HIMSS. Jacob Krive resides in the Chicago metropolitan area with his wife, Dr. Marianna Krive, and two young sons. Learn more about Dr. Jacob Krive and to view a list of selected publications.